After my late-breaking news yesterday, I am back with my Pecha Kucha presentation about “Why I play with puppets”. Okay, here is the first pillar of Emotional Intelligence: Self-awareness. This is an understanding of who you are and taking responsibility for your actions. Knowing your own strengths and weaknesses and how your actions affect others. It is not the same as being self-centred. Self-centred people believe the world ows them. Sorry guys, it doesn’t. But don’t worry, when you are in you late teens or early twenties, you are allowed to be a little self-centred as you have to find out who you really are, not who your parents and peers and teachers try to tell you you are. 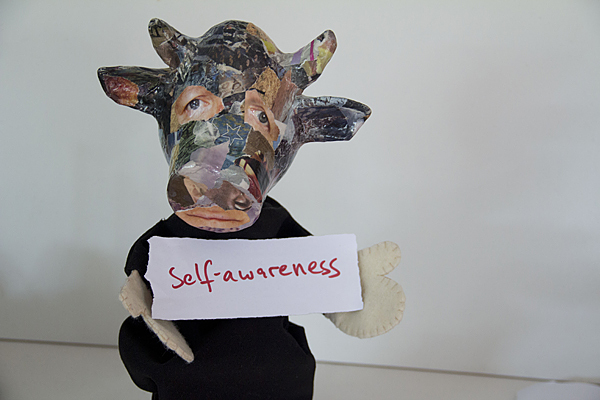 By the end of your tweens the self-centredness should have morphed into self-awareness. If not – it’s time to get worried!